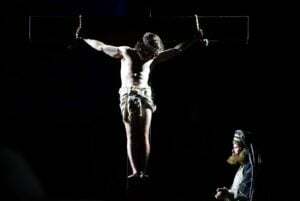 The Mystery plays were performed in York originally in the 14th Century. They were performed by members of different guilds, each performing on a waggon which was drawn around the streets of York. 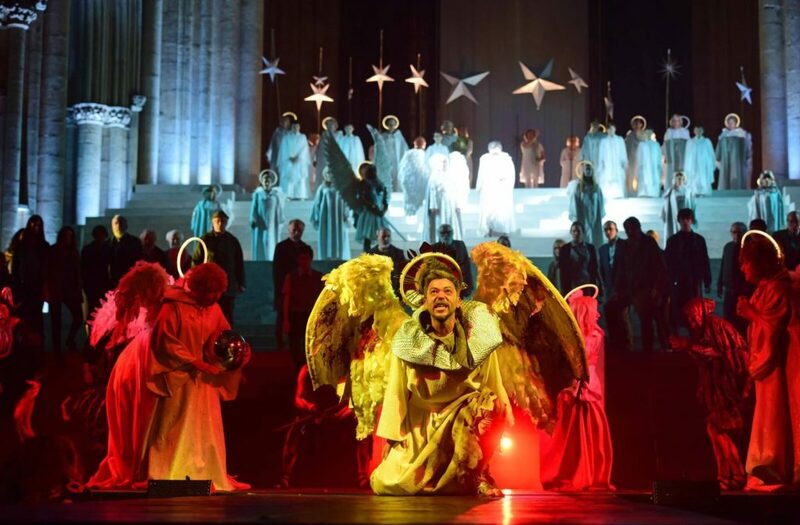 Since the revival of the Mystery plays in the 1950’s, the plays have been held outdoors in a variety of venues, and for the second time only, indoors at York Minster. The cast comprises of one paid actor, all others are community actors. Excited people gathered to watch the play: the Bible portrayed in a feast of drama, music and amazing make-up and costumes. The play starts with the fall of the angels, and Lucifer going from angel to demon. It is followed by God creating the universe, with huge spheres representing the planets. The language of the play is fascinating, it is in verse (but you don’t really notice that) and with lots of Yorkshire dialect and humour. The music provides the themes for the cast, and background content. The combination of modern and more historical costumes works well throughout the play. The Ark with its animals is truly amazing. The detail in all of the costumes is wonderful. Lions, elephants, giraffes, monkeys, birds and butterflies all get on board. The door shuts, and up run the dodos. Now we know why we don’t have dodos!! The play continues with an evocative portrayal of Abraham and the sacrifice of Isaak. Next is the portrayal of Mary and Joseph. Joseph is concerned that his wife to be is pregnant, but he knows that it is not his. It takes an Angel to come and reveal that he is to take Mary as his wife, and so they go to Bethlehem. The donkey makes the scene for me, so realistic and patient. The shepherds too are visited by Angels, and go on their way to see baby Jesus full of song. The costume of Herod is magnificent, lots of gold material, and again humour mixed in with the dialogue of the Kings visiting him. The kings wend their way to present Jesus his gifts, and Herod plots to kill all young boys in Bethlehem. The massacre of the innocents is a reminder of the brutality of Roman times. The second half brings to its climax the death of Jesus, the resurrection, ascension and judgement. This whole section is perfectly acted, with lots of fighting action, the joy of the resurrection, Thomas’ disbelief and Peter’s denial of knowing Jesus. The final song brings together the sound of the Minster organ, and the whole cast on stage. It is a true spectacle, and a crucial moment in the history of York.